Kati’s Chronicle – Look, I can stand ski! What a day! Kati and I woke up Friday morning for a ski day. We were both expecting a cold windy day but we were greeted by blue skies and great snow. As we unloaded the car, Kati plopped in her wheelchair in the equipment room of NSCD. We asked Karen, the sit ski coordinator, if Kati could try a stand ski, also known as a slider (it was Ben, a fellow volunteer’s idea). Karen told Kati if she was patient, she could find someone to take her out. Are you kidding me? Kati is the queen of patience! Karen found the most wonderful instructors a student could ever have! Tony, Liz and Lorena fit Kati into ski boots and a walker with skis attached. Kati’s calves are still sore from the ski boots, but at least she is stretching her tight calves. Kerry, her physical therapist is going to be happy! While they were getting Kati adjusted, I was at Discovery Park with my student, Sarah and my teammate Susan. Sarah, Susan and I couldn’t wait to see Kati come off the lift. Finally, we saw the polka dotted ski coat and Kati’s entourage come down the hill. Everyone on the bunny hill was cheering and hollering Kati’s name. Kati was just so excited to be upright after several years of being in a sit ski. 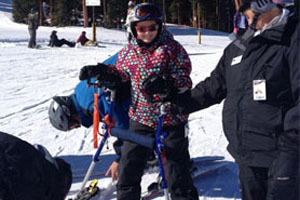 Tony gently guided her off the ski lift and down the mountain with Lorena on the tethers. Ben felt goosebumps up and down his arms! I finally got to ski a run with my daughter and I had tears in my eyes! I LOVE the NSCD!!!!! Her goal for next week is to go back over to Jack Kendrick, a longer run, and ski down the mountain! This kid is fearless. From Warrior to Mentor is NSCD athlete, Staff Sergeant Michael Plourde. After several years as an Army medic, which included three deployments to Iraq and Afghanistan, Mike required medical treatment for the many injuries sustained over the years. 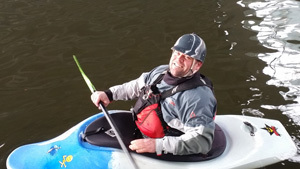 During his rehabilitation at the Warrior Transition Unit in Fort Campbell, Mike got involved with the Team River Runner kayak program. Two years later Mike moved to Denver and found the NSCD through their partnership with Team River Runner. Today, Mike is working towards a degree in Biology and mentors other military veterans and athletes with disabilities through his involvement at the NSCD. After suffering a TBI in 2004, I thought my love of sports was only a dream. But each year I get stronger, more creative and adjust to my “adaptive” way of doing sports that I love. I was told I would never ski again – until I found the National Sports Center for the Disabled. This program is dedicated to year-round sports for any injury/disability to help you accomplish your dreams in a very safe and dedicated place. In January 2011 our 1st trip was planned, and I was so excited. My 1st goal- I wanted to ride the chair lift. In a matter of 18 months, I would learn how funny that was and just how far I could reach my potential. I started…in a “mountain man” and got to ride the chair lift on my first day. My family said the smile on my face the first time down the mountain was “priceless”. The next morning I met one of the most incredible instructors, Tommy Moore. He said I was coming out of the “mountain man”– he just had to figure out “how”. Balance, right-sided weakness and conserving energy were crucial. 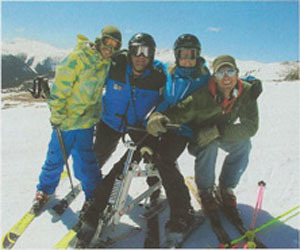 He used his adaptive skills and pulled out a ski bike, built like a recumbent bike on skis. Thanks to Tommy’s encouragement, dedication, adaptability, knowledge and so much more, he started me on a path to follow my dreams, build my confidence and allow me to accomplish more than I ever imagined. Since January 2011, I have returned five times. I work closely with Tommy and Jeremiah, another amazing adaptive instructor, teaching me more skills and regaining muscle memory, just like before. With a smile and rising confidence, I am having the time of my life and part of “me” is back. This past winter everyone noticed my improved strength and speech and that was exciting to hear. Jeremiah took me down my first “black diamond” run. On my last day skiing for the season we were up at the very top of the mountain, taking in all the beauty and for the first time, I felt totally free of my injury. The tears were flowing, but this time not tears of despair but of pure joy. Perseverance is vital, there will always be obstacles, but to push through them and overcome them is what really matters. NSCD gave me back the ability to love sports again and after years of speech therapy I have a voice to tell the world about this program, and now I am leaving others speechless as they watch me ski past them. The NSCD also offers summer programs. We do horseback riding, kayaking, hiking, rock climbing and whitewater rafting, just to name a few fun things. It is all adapted to any injury/disability along with very skilled instructors. Check out my video of my first season out at the NSCD on YouTube: “Another Dream Accomplished with NSCD”. At the NSCD there are no boundaries to what you can accomplish – tell them your dreams and they will make it happen. BIS has also encouraged me through my recovery, allowing me to have a vision of skiing again. If you are a survivor and would like to know more about the program, please check with your case manager about opportunities like this and others available to us. It will change your life forever. 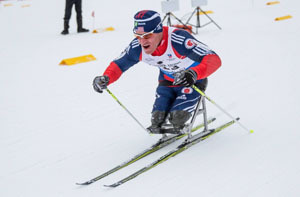 Stephen was the first adaptive ski racer to represent Vermont in high school ski competitions and competed for several years with the Vermont Adaptive Ski and Sports (VASS) ski team throughout middle and high school. After graduating high school he moved to Winter Park, Colorado and started training with the National Sports Center for the Disabled (NSCD). 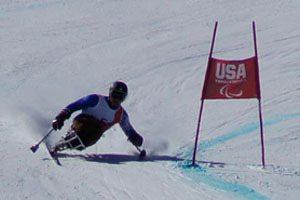 Stephen’s goal is to make the U.S. Paralympic Team.